Without a doubt the lure of the world famous temples of Angkor Wat has made Cambodia a must see destination in Southeast Asia, but just what is it about the country that turns so many tourists into expats? Some are undoubtedly attracted by the nation’s rich history, unique traditions and charming culture. Others have realised the significant financial benefits of relocating to one of the most open economies in the region for foreign investors and professionals. One reason expats and tourists often give for their love of Cambodia is the positive attitude of the local population towards foreigners. They speak warmly of being greeted with a friendly “Khmer smile” and treated as special guests wherever they go.English is the second language of choice for many Cambodians, especially in major cities and destinations, thanks to the growth of tourism and increasing number of international companies entering the market. Cambodia uses the U.S. dollar as the defacto currency. This provides economic stability and makes life easier for those running businesses or relying on overseas incomes. For many people their first taste of Cambodia begins in the capital city of Phnom Penh, which offers an enticing mixture of colonial-era buildings, Royal palaces, Buddhist pagodas and local markets which are complemented by the city’s expanding skyline of skyscrapers and apartments. Phnom Penh is popular with investors and professionals, while the city of Siem Reap is the key driver behind the booming tourism industry. Visitors flock to the area known as “Temple Town” to see the magnificent Angkor Wat Temple Complex, the largest religious monument in the world covering an impressive 1,636,000 square metres. 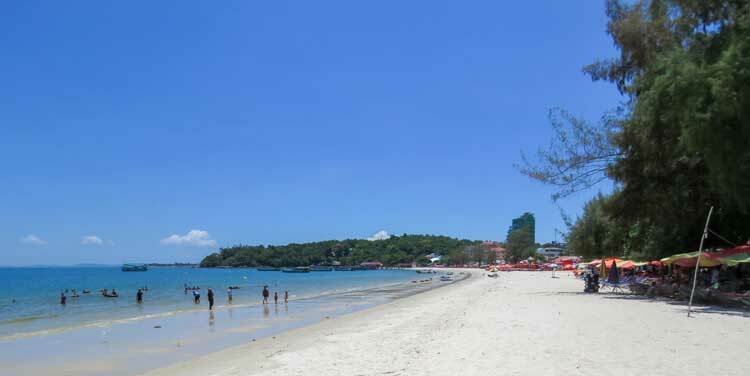 For those with a love for sandy beaches and the ocean, the country’s main coastal destination is Sihanoukville, which is popular with Cambodians, expats and tourists alike. Offering something for people on every type of budget, you can opt to live like a backpacker in a bamboo hut or luxuriate in a five-star hotel with its own private beach. Other favoured expat destinations include the colonial city of Battambang, the relaxed riverside town of Kampot and the chilled out coastal resort of Kep. Cambodia’s geographic location places it at the heart of Southeast Asia. As such it has quickly become a hub for regional travellers with three international airports–in Phnom Penh, Siem Reap and Sihanoukville–catering for millions of visitors each year. Many expats move to Cambodia to retire and enjoy the laidback tropical lifestyle. Others relocate for professional reasons or to set up their own businesses. It is estimated there are now more than 100,000 expats that are permanent residents in Cambodia. Their presence has led to the growth of a wide variety of international restaurants offering tasty cuisine from almost every country in the world. There is also a proliferation of associations and chambers of commerce such as AmCham, BritCham, AusCham and EuroCham which are popular with the business community and expats who like to network. Another indicator of the country’s potential is that its economy is one of the fastest growing in the world. Foreign investment is pouring into the manufacturing, agriculture, telecoms, banking and tourism industries, creating business and job opportunities for locals and expats alike. Without question Cambodia offers the most flexible and accessible long term residence visa of any country in Asia. On arrival, and for a few hundred dollars, you can get a one-month business or “E” visa that can be extended annually with a minimum of paperwork. The cost of living is low here. This makes it an enticing proposition for those on limited incomes or pensions who are seeking to relocate overseas and enjoy a higher standard of living at a lower cost. A single person can live comfortably for $1,690 per month, while a couple could spend as little as $2,704. If you are dreaming about moving to Southeast Asia to experience a higher quality of life whatever your budget, then Cambodia may well be the country you’re looking for. Is It Safe to Live in Cambodia? When I asked a friend why expats like himself chose to live in Siem Reap, he looked at me in disbelief, shook his head and laughed as he mockingly enquired if I had ever heard of the world-famous Angkor Wat Temple Complex? A rising wave of affordable aviation deals to exotic destinations has been a turning point for travel. Never before in human history have so many people booked holidays to countries they have never heard of… But that’s okay, it’s all part of the adventure! For those savvy enough to buy bargain tickets to Cambodia, but who aren’t quite sure where the country is or what it is like, this is for you. Read more: Where is Cambodia? Read more: Is It Safe to Live in Cambodia?